Blue Ridge, GA is one of the prime places to see the beautiful colors of fall foliage. Boasting an extended period for leaf peepers, Blue Ridge offers a variety of ways to enjoy the crisp mountain air and colorful changing leaves of autumn. Because of the varied elevations in the Blue Ridge Mountains, the season can last for almost over a month, but the best time to come is the third week in October to the first week of November if you want to bask in the warm autumn sunshine of peak leaf season. There are many ways to experience the beauty of the North Georgia mountains in autumn and below are a few favorites from our staff and past guests. Brasstown Bald - Go to the state’s highest point in Georgia at 4,784 ft above sea level, and you will be rewarded beyond belief! Brasstown Bald is one of the first to display the season’s vibrant fall colors. Blue Ridge Scenic Railway - Offering Fall Foliage Train Rides from 9/28-11/12, enjoy a leisurely train ride along the Toccoa River. Meandering through the mountain countryside, the fall colors are in abundance. Swinging Bridge - Take a picnic and enjoy your lunch along the riverside after crossing the historic swinging bridge over the Toccoa River. Beautiful hikes and scenery can be enjoyed. Horseback Riding - Many horseback riding outfitters offer fun rides on trails meandering through the mountains featuring breathtaking views of the fall foliage. A family-fun way to get outdoors and enjoy the crisp breezes of autumn. Vineyards and Wineries - May award-winning vineyards dot the landscape throughout Blue Ridge and North Georgia. Indulge yourself by warming your toes by the faint glows of a fire pit, overlooking hilly vineyards, listening to live music while sipping a glass of wine. This just may be where you’ll want to park it for your entire stay! Scenic Drives - The mountains of Blue Ridge offer many scenic routes that are some of the best ways to see the fall colors without breaking a sweat or spending any money! For directions to self-guided tours, click here: https://www.blueridgemountains.com/plan/self-guided-tours-and-maps/. Visit Mercier’s Orchard - A family-owned farm since 1943, Mercier’s is Georgia’s top orchard featuring you-pick events, organically grown fruits and vegetables, award-winning fried pies, hard-pressed beverages grown and manufactured on site, cafe, gift shops and more. In October, enjoy tractor tours, u-pick pumpkins, and more. Family Fun - Wandering through a corn maze or picking your own pumpkins to carve for the season are just a couple of memorable autumnal things to do in the Blue Ridge area. Uncle Shuck’s Corn Maze and Burt’s Farm are both located in Dawsonville, GA making for a fun scenic day trip from Blue Ridge. 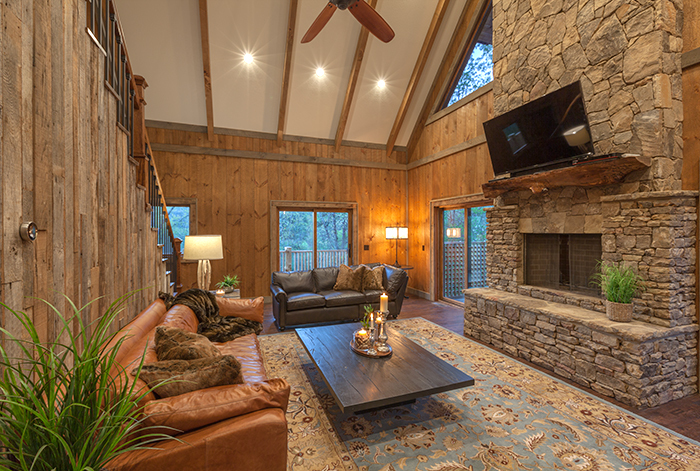 Stay in a Luxury Cabin - And finally, for those who wish to simply plant themselves on the porch overlooking the fiery colors of mountain vistas with a glass of wine in hand and perhaps a fire softly crackling in the outdoor fireplace. We offer many beautiful cabins hand-picked for their exceptional views be they mountain views, or lake, creek, or river views. You are sure to find your perfect Blue Ridge oasis and make a memory or two. Fallen Timber, how wonderful you are! Thank you so much for the wonderful stay. The last few days have been such a relaxing experience. We appreciate the great cabin that we got when we arrived. Memories have been made, relationships have been made stronger and better, and we all leave with rested minds and spirits.